This study is designed to help readers understand what narrative is, how it is constructed, how it acts upon us, how we act upon it, how it is transmitted, and how it changes when the medium or the cultural context change. 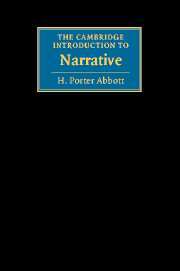 Porter Abbott emphasizes that narrative is found not only in the arts but everywhere in the ordinary course of people's lives. An indispensable tool for students and teachers alike, this book will guide readers through the fundamental aspects of narrative. Preface; 1. Narrative and life: The universality of narrative; Narrative and time; Narrative perception; 2. Defining narrative: The bare minimum; Story and narrative discourse; The mediation (construction) of story; Constituent and supplementary events; Narrativity; 3. The borders of narrative: Framing narratives; Paratexts; The outer limits of narrative; Is it narrative or is it life itself? ; 4. The rhetoric of narrative: Causation; Normalization; Masterplots; Narrative rhetoric at work; 5. Closure: Conflict: the agon; Closure and endings; Closure, suspense, and surprise; Closure at the level of expectations; Closure at the level of questions; Absence of closure; 6. Narration: a few words on interpretation: The narrator; Voice; Focalization; Distance; Reliability; Free indirect style; Narration on stage and screen; 7. Interpretation: The implied author; Underreading; Overreading; Gaps; Cruxes; Repetition: themes and motifs; 8. Three ways to interpret narrative: The question of wholeness in narrative; Intentional readings; Symptomatic readings; Adaptive readings; 9. Adaptation across media: Adaptation as creative destruction; Duration and pace; Character; Figurative language; Gaps; Focalization; Constraints of the marketplace; 10. Character and self in narrative: Character vs. action; Flat and round characters; Can characters be real? ; Types; Autobiography; Life writing as performative; 11. Narrative contestation: A contest of narratives; A narrative lattice-work; Shadow stories; Motivation and personality; Masterplots and types; Revising cultural masterplots; Battling narratives are everywhere; 12. Narrative negotiation; Critical reading as narrative negotiation; Closure one more time; The end of closure? ; Glossary; Index.